USB flash drive gift box packaging, flash neck straps and accessories. You've picked out your drive style, and added your logo. Don't stop there. Add an lanyard, key chain, or a stylish gift packaging option. Add .30 each for lanyards. Check with customer service to confirm that a lanyard is available for your USB flash drive model. Standard colors are red, blue, black, green, and gold. Add .35 each for key chain. Add .35 each for economy box. Available in white gloss and black gloss with clear window. Add .70 each for gloss gift box. Add 1.20 each for plastic gift box. Add 1.30 each for Metal Gift Box. This is a high quality, sturdy box. Add 1.45 each for deluxe gift box. Not all gift boxes or accessories are compatible with all USB flash drive models. 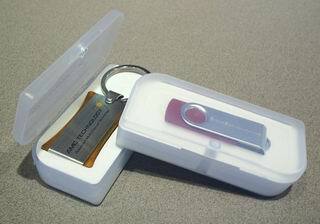 Contact a customer service representative (service@usb2usb.com, 916-789-9929) to insure that your drive model is a match with your requested lanyard or gift box. Customer service representatives are available Monday - Friday from 7:30 AM to 5:30 PM Pacific Time. We are looking forward to serving you.